French tosafist; born in Paris 1166; died there 1224 (Solomon Luria, Responsa, No. 29). According to Gross he was probably a descendant of Rashi, and a pupil of Isaac b. Samuel of Dampierre and his son Elhanan. He married a daughter of Abraham b. Joseph of Orleans, who has been identified by Jacobs ("Jews of Angevin England," p. 409) with Abraham fil Rabbi Joce, chief Jew in London in 1186. 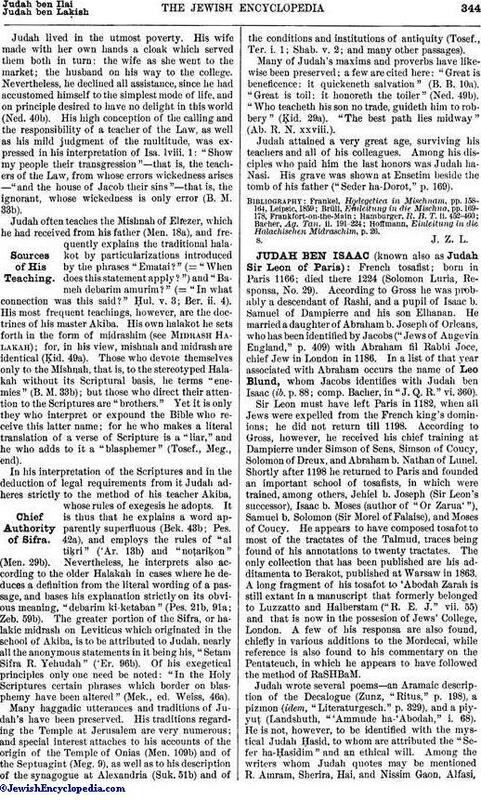 In a list of that year associated with Abraham occurs the name of Leo Blund, whom Jacobs identifies with Judah ben Isaac (ib. p. 88; comp. Bacher, in "J. Q. R." vi. 360). Sir Leon must have left Paris in 1182, when all Jews were expelled from the French king's dominions; he did not return till 1198. According to Gross, however, he received his chief training at Dampierre under Simson of Sens, Simson of Coucy, Solomon of Dreux, and Abraham b. Nathan of Lunel. Shortly after 1198 he returned to Paris and founded an important school of tosafists, in which were trained, among others, Jehiel b. Joseph (Sir Leon's successor), Isaac b. Moses (author of "Or Zarua'"), Samuel b. Solomon (Sir Morel of Falaise), and Moses of Coucy. He appears to have composed tosafot to most of the tractates of the Talmud, traces being found of his annotations to twenty tractates. The only collection that has been published are his additamenta to Berakot, published at Warsaw in 1863. A long fragment of his tosafot to 'Abodah Zarah is still extant in a manuscript that formerly belonged to Luzzatto and Halberstam ("R. E. J." vii. 55) and that is now in the possesion of Jews' College, London. A few of his responsa are also found, chiefly in various additions to the Mordecai, while reference is also found to his commentary on the Pentateuch, in which he appears to have followed the method of RaSHBaM. Judah wrote several poems—an Aramaic description of the Decalogue (Zunz, "Ritus," p. 198), a pizmon (idem, "Literaturgesch." p. 329), and a piyyuṭ (Landshuth, "'Ammude ha-'Abodah," i. 68). He is not, however, to be identified with the mystical Judah Ḥasid, to whom are attributed the "Sefer ha-Ḥasidim" and an ethical will. 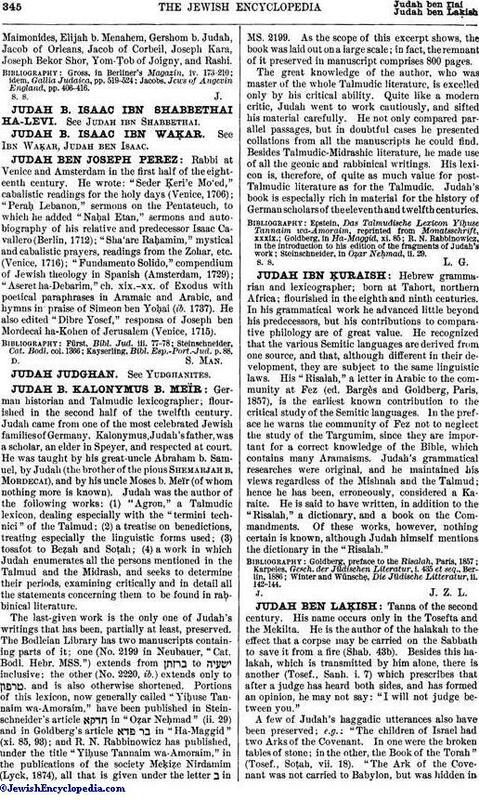 Among the writers whom Judah quotes may be mentioned R. Amram, Sherira, Hai, and Nissim Gaon, Alfasi,Maimonides, Elijah b. Menahem, Gershom b. Judah, Jacob of Orleans, Jacob of Corbeil, Joseph Kara, Joseph Bekor Shor, Yom-Ṭob of Joigny, and Rashi. Jacobs, Jews of Angevin England, pp. 406-416.